Mix the ingredients in a food processor until it becomes a sticky kind of a dough. 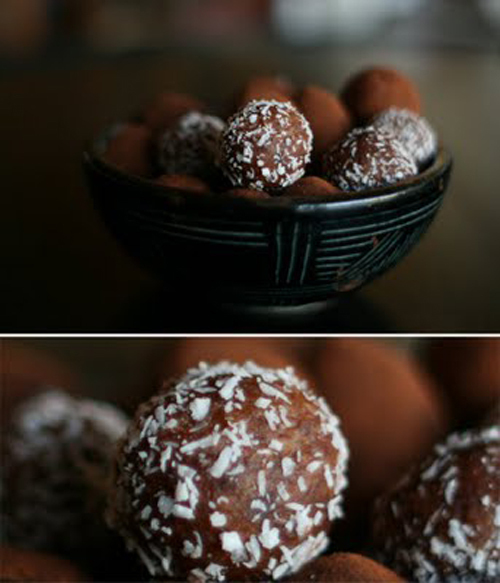 I made balls from the dough and rolled some of it with cocoa powder and some with the dried coconut meat. You can improvise a lot here, the measurement doesn´t have to be accurate and it´s good to add all kinds of dried fruits, seeds and nuts. The house by the sea on Facebook. I am posting all kinds of things related to food. If you like food, good recipes, food politics and everything else related to food this is the page to like. Oh yum, yum. These look so good. Sounds great! I made some thing similar recently, some no-bake carrot cake balls with shredded carrots, oats, prunes, a teeny bit of butter and sugar, and some spices. I’ll have to give this version a try! And it sounds good to add some carrtos. I am going to try these this month while my son is vegan during the fast of the apostles! What a nice vegan treat for him!